It can be difficult to take a bite out of life when you are missing multiple teeth. You may not feel like smiling so much, and eating can become a chore. But dentures and partials can come to the rescue in cases of significant tooth loss. These are prosthetic teeth that take the place of the ones you are missing. And thanks to modern materials and methods, dentures in Woodstock are more comfortable and natural-looking than ever before! Keep reading to learn more about them -- including how they are made and why they are important. Dentures in Towne Lake are a complete set of prosthetic teeth that can replace an entire arch missing from the upper or lower jaw. Partials fill in the gaps when some natural teeth still remain healthy in the gum line. 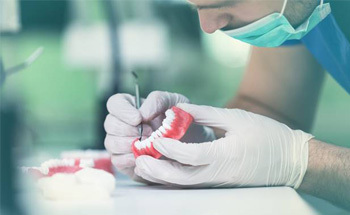 A complete denture is held in place using natural suction and the help of a denture cream, as needed, while a partial denture is secured with brackets affixed to the remaining natural teeth. 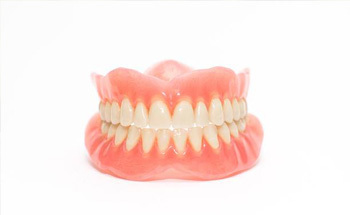 Creating a complete or partial denture usually requires 4 to 5 visits to your dentist’s office to ensure the fit is just right. First, an impression or mold will be made of your mouth and any remaining teeth. You will be asked to bite down several times to ensure the proper relationship between the upper and lower jaw is captured. Then, these items are sent to a dental laboratory where the dentures will be created from high-quality materials. This process will be repeated several times, until your dentist in Woodstock presents you with a new set of teeth that look and feel just like they should! At first, tooth loss may not seem like that big of a deal -- but having your teeth replaced promptly is crucial for your lasting oral and overall health. Missing teeth contribute to a host of issues, including damaged self-confidence, a poor diet, and further tooth loss as the jaw bone loses its strength and stability. If you have lost a substantial amount of teeth, getting them replaced promptly is of the utmost importance. Your restorative dentist in Towne Lake can help you eat, speak, and smile with ease once more, thanks to full and partial dentures! To learn more about this restorative option or to schedule an appointment, do not hesitate to get in touch with the team at Dream Dental!